Standard AutoCannon (AC for shorthand) are the most basic ballistic weapon systems in Mechwarrior: Living Legends. They represent various ballistic weapons that are rapid-firing and auto-loading. A Warhammer B firing an AC10. Standard AutoCannons are functionally identical to their older predecessors. 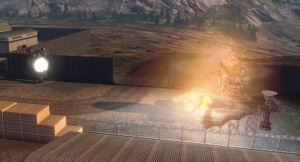 They deliver damage by firing armor-defeating shells at a high rate-of-fire. There are four classes of Standard AutoCannon: AC2, AC5, AC10, and AC20. Because of the ballistic nature of a weapon's trajectory it is possible to strike targets beyond the maximum listed range by aiming high to lob the shell at the target. As the target gets farther outside the listed range, however, damage drops off. Also, because of the time delay between the weapon's firing and the shot's arrival at the target it can be difficult to aim accurately -- especially if the target is actively evading. Standard Autocannons are classified with an arbitrary number system that roughly indicates the respective damage-dealing capabilities; larger numbers (AC20's) will deal much greater damage than smaller numbers (AC2's). Both the AutoCannon-2 and AutoCannon-5 feature a high rate-of-fire making them ideal Anti-Aircraft and anti-BA weapons. They also perform acceptably against lightly armored, highly mobile opponents such as Light 'Mechs or Hover Vehicles. Long weapon range also makes them suitable long range direct fire support weapons, aiding friendly brawler units from a safe distance. The AutoCannon-10 and AutoCannon-20 trade rate-of-fire for improved damage-per-round, making them much better at dealing with heavily armored targets. They also inflict splash damage, meaning that nearby unit components will also take some damage depending on how close they were to the point of impact. It is important to recognize that the AC10 and AC20 both have noticeably shorter ranges than the AC2 or AC5. This can be especially problematic for the AC20, with a range limited to 350 meters making it difficult to bring the weapon into play when used in wide open areas. The first Standard AutoCannon was an AC5 introduced in 2250 by the Terran Alliance, and would be followed by the AC2 in 2300 (Terran Alliance), the AC10 in 2500 (Terran Hegemony), and the AC20 in 2500 (Lyran Commonwealth). The weapons represent a wide range of heavy ballistic cannon with varying rates-of-fire and calibers ranging from 30 millimeters at the lightest up to larger than 200 millimeters. Among the Clans the Standard AutoCannon was phased out sometime around 2820 in favor of the newer Lubalin Ballistics-X AutoCannons and Ultra AutoCannons. Even in the Inner Sphere the standard AC only continues to remain in use due to lower cost of production and the introduction of specialty munitions which are usable only by these weapons. This page was last edited on 15 April 2019, at 17:51.